Matt from Cardboard Conundrum recently opened a box/pack of this year's Stadium Club. 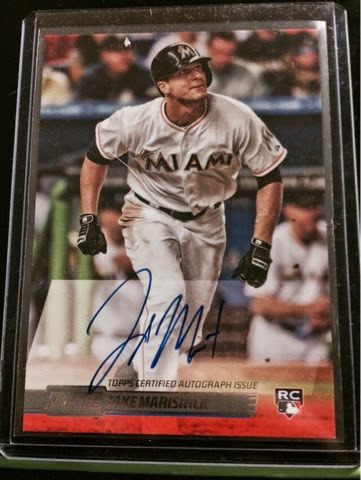 He pulled an auto of current Astro Jake Marisnick. I asked about it and before we could work out a deal, he just sent it, I'm sure he knows I'll send some Cubs his way! Here's the card! Thanks for the card Matt! Hopefully George never becomes trade bait for the Astros and all these cards I'm piling up get to stay in the permanent collection! Again, thanks for just stopping by and reading this. This month is my second go around with Collector Crate! So far, I love it! I go for the Gold level box because really it's about my only pack or box buying opportunity up here in the panhandle. So, last month was pretty exciting stuff, let's see what the box holds in store this month! Here's what the box looks like, nothing fancy, simple and understated, just like me. So they throw in some items relating to the three teams you picked. I went for Astros, Rangers and Yankees, mainly for trade-ability factors. The sunglasses have a Yankees logo so you won't see them on this noggin! But fun items for sure, last month I got a Giants mini baseball and Pirates pennant. Let's get into the cards!!!!! First up, a sketch card print exclusive to Collector Crate! Next up, the (3) relics and (3) autographs that come standard with each Gold box! Kemp, Sosa and Piazza on the relics, not shabby at all. J.P. Murphy, Vernon Wells and HOW ABOUT A SPRINGER AUTO!!!!! I do believe the Springer was on purpose based on the teams I selected as it was the top card in the manilla envelope, VERY happy Collector Crate is customizing in this way! Alright, how about the packs???? 10 Total with the Gold Box and a promise of some high end mojo! I decided to do a picture of each pack and the best card I feel I pulled from each! The Gwynn /999 is nice, but this set just doesn't look great in my opinion. Can't wait for them to some day get a license. It will improve their product by 513%, at least, arbitrarily. Yep, Honest Abe was the best card. Another product with decent intentions what went awry. Finally, the last "junk pack" as I would call these first three. 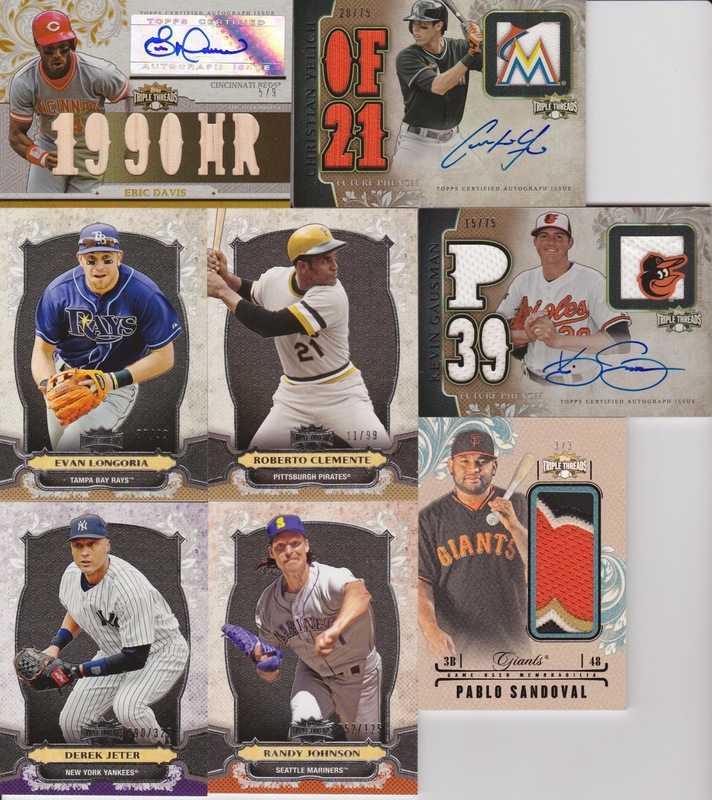 None of these are "high end" and again the lack of a license is a killer on the sports cards: 2013 Goodwin Champions. Cheatin' Tiger is the best in the pack. It was a lousy pack. Moving on. Somewhere along the way they stopped caring about A&G and just puked out sets like 2011 hoping collectors would fawn over it like they did in years past. Meh. RMS Queen Mary, welcome to the board, ghosts and all. The McCann /1199 is the best one in this pack! Half way through, we get into some retro packs! 1996 Leaf Preferred! If I was a fan of Barry Larkin (which I am not) I'd LOVE this metal card! Hopefully there is a Larkin fan who would love this card. I don't remember this set at all, but cool to open a pack! I had high hopes of a Griffy RC in this next pack of 1989 Upper Deck, the set that started the Griffey fame! But alas my only Rookie was the rather disappointing Gregg Jefferies. Brought back some memories though, his was pretty well sought after as well! Here's another set I don't remember and that I don't think I ever opened a single pack! 1993 Bowman with "Special Engraved Foil Card" in every pack! Mr. Larry Sutton, we never knew you, no really, I don't think anyone knows who you were, cool card though, very shiny! Apparently, 13 year old me missed out on Topps Finest 1993, maybe I was just too poor to open this stuff. I was hoping for a refractor that would sell for millions. Instead, All Star of Fred McGriff. Meh. And finally, the two big BOOOOOM cards of this Collector Crate! Shelby "Don't Call Me a Cardinal" Miller gold auto /25!!! WOO HOO!!! Current Twins #1 prospect Byron Buxton! Everyone says we should have taken him over Correa, I'm fine with Correa but Buxton is no slouch. Both need to get healthy! Ok, so I've got a lot of people asking me, "But Mr. Dimwit, is it worth it?" Well, here's my official stance on Collector Crate: I love it. Whether it's worth $100 for the Gold Box or not, it's a heck of a lot of fun to bust open! They put fun stuff in the box along with the packs. The packs hold a lot of potential as well. I'd much rather have this than a single box of any product on the market that I could buy for $100. Is it perfect? No. Some of the pack selection (like any Panini products or Upper Deck) is less than desirable. I ordered the baseball box, I'd like baseball cards. But I would never go buy a pack of Sterling on my own, so it's cool it's part of the deal. 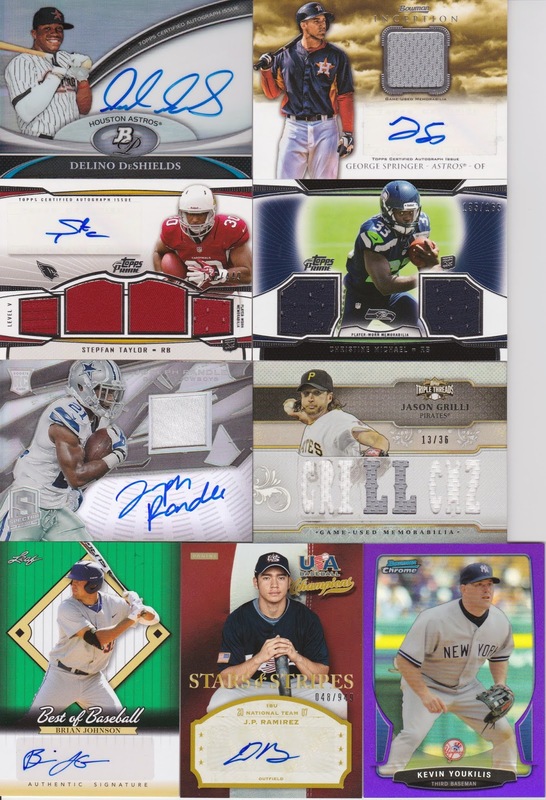 Last month my "big pack" was actually an unopened box of Panini Prime Cuts from 2012. So it's definitely worth the gamble for me, and I have a blast opening the product! I saw Dave and Adam were having a sale and picked up a box for myself and a box for the wife! I was a huge fan of Americana Heroes and Legends, mainly because of the NASA Astronaut relics and autographs. For $45 I took a chance at pulling something historic! Ok, so while not historic, I did end up with some great cards! The Fernandez is a PROOF numbered out of just /99, the Lindsey is a gold parallel numbered out of /159 and the Jansen is out of just /99! Not bad at all! I may keep the Jansen as I remember that Lillehammer Olympics quite vividly & remember watching the race that won him the gold (finally!). Although all three are at "TRADE BAIT" status for now! As for the wife, I picked up a box of Season 1 & 2 of Downton Abbey cards! She loves the show, I'm not sure I quite get it, but apparently it's pretty popular. I tried one episode and really, anything British gets me sleepy... but she beat the odds and got 3 hits! Two autos and a dual relic! Not a bad haul from Dave and Adam's! Christopher over at Crackin' Wax recently held his end of the year Private Group Break. 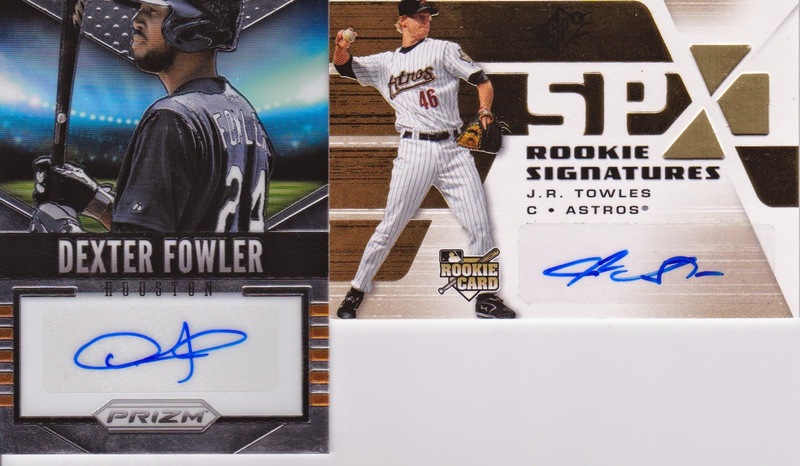 I snatched up my Astros and ended up with a greater than expected stack of cards! Especially after the surprise box of Triple Threads! A nice surprise getting an Altuve autograph! Not sure who this Feliz guy is, will have to do some research! The big surprise was the SPRINGER! I had been keeping an eye on the /100 Springer auto on eBay but it always went for a bit more than I really wanted to spend. It was great getting this auto in a surprise box! I don't ACTIVELY go after any more Roy Oswalt cards, but if someone has one and are offering up, I'll take it if I don't already have it. Roy had a decent career, don't think he'll get a sniff at the HOF but I think he'll go down as one of the best Astros pitchers and was pretty clutch in my memory. Wesley Wright, it was nice knowing you, I'm not sure if he's still in baseball or not. This was the clincher of the deal. 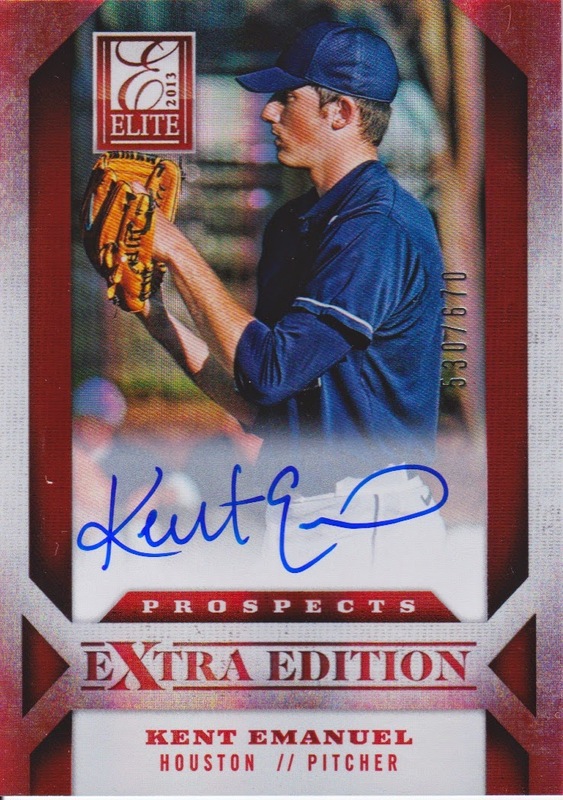 I'd been wanting a Kent Emanuel auto and finally came across one in a trade! I think this guy may just pan out as a decent arm at the back of a rotation in a couple of years. Here's another twitter purchase, think I picked up these two for $5 delivered... you really kind find some great deals on twitter if you have the patience and stay focused on what you're looking for! A nice 4 color swatch of the 4 round pick! 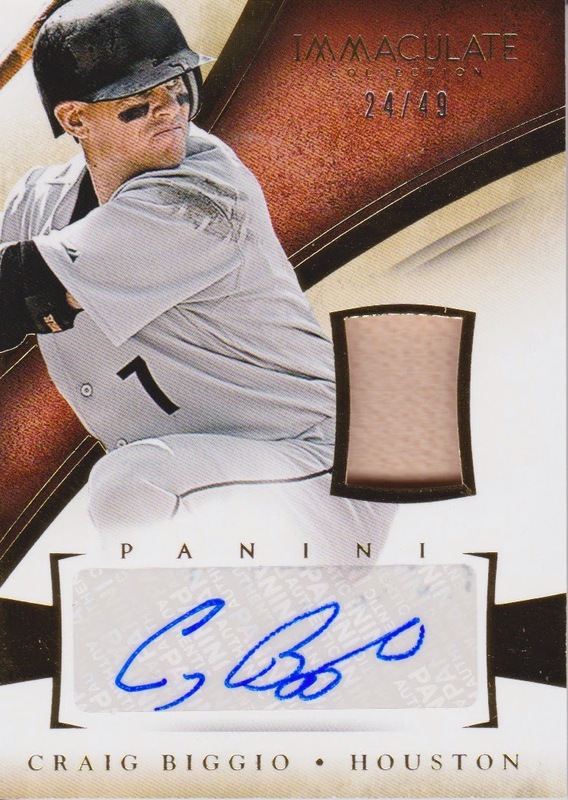 And then a patch auto of our 4th rounder this past year! Neither have done anything really significant this year, in fact Clowney has been a complete disappointment so far; hopefully that changes today in Cleveland! Next up we have another $5 twitter purchase! I'm telling you, people just want a little cash to unload their lesser hits, works great for an Astros collector!!!! They cut off Fowler's head!!!! Ok, I get it Panini, you can't show logos but that doesn't mean you can't show the helmet... whatever, there's a reason it and Towles' autos can be had for $5! I like the design of the cards for Prizm, the lack of logos is just a killer for me. Finally, a couple cards I picked up out of group breaks! I decided I was done buying full boxes of Triple Threads after last year, and while it is fun to open a lot of times it's a complete swing and a miss. Most of the times I can get the Astros in a group break on half a case for under $20, it's worth the risk. A nice /9 Gonzo auto (I was STOKED when I saw him on the check list as an Astro, not so much when I saw Pudge Rodriguez on there as an Astro). L.J. Hoes is a curious case. He could be a decent 4th outfielder, but I definitely don't see him as a "Future Phenom". 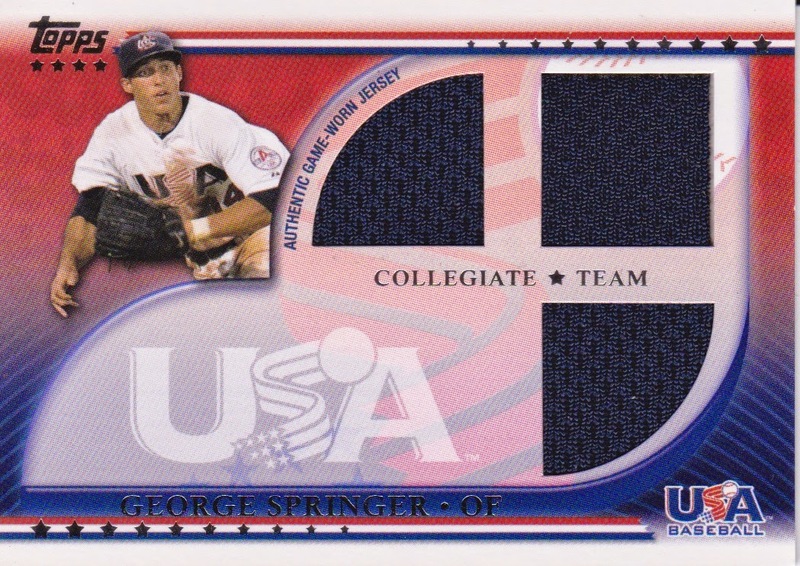 This should have been Singleton, Keuchel, Springer or even Robbin Grossman on this card. Just my two cents. Have a great day of watching football everyone! A SWEEEEEET card from the height of the Astros "glory days". Clemens, Lidge and Pettitte in Astros uniforms, just awesome! On Twitter: Yea, I'd gladly take that off your hands Mr. Twitter Guy. $20? I guess I won't haggle, I mean he's an Astro so it's a crappy card right???? No one else wants it, but whatever, I'll throw you a 20 and be done with it... (Inside my head: YES YES YES YES YES YES, I got a Biggio auto/relic #'ed /49 for only $20!!!!!!!!!) Don't know why that was in my head, since this was a twitter interaction, but I spared the Hotwit the loss of hearing by not yelling it at the top of my lungs. Bench Warmer... what a great name for a set... apparently they just sign up models to take pictures in skimpy clothing and then sign the cards. Am I complaining? Not one bit. Oh, you card collecting super nerds want to know how the back of the card is designed? What fonts they use? etc, etc??? Well, who am I to deny you from appreciating the fine work of the Bench Warmer's editorial staff??? 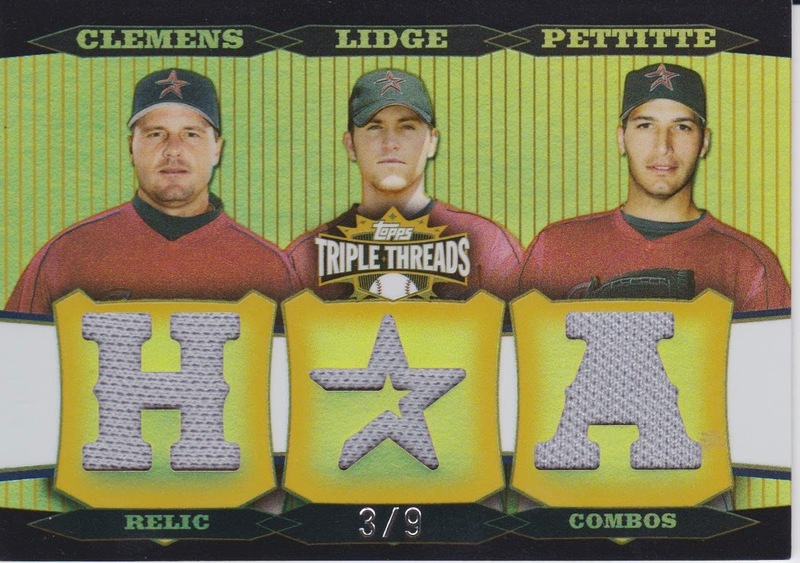 Ok, forgive the lame title and stretch into a Star Wars reference... but I joined a group break over at SixEightCards.com for a half case of Triple Threads, of course I picked my beloved Astros. It took well over a month and a half to fill the break, and during the course of it all the owner and I exchanged some e-mails about refunds and fear it'd never fill. Anyways, in the end he felt bad it took so long to fill and said he'd throw in a surprise for me once it broke. So... the break went down and the Astros fell completely cardless. So, for my $29.00 buy-in, I ended up with some more TRADE BAIT!!!! By the way, I'm running into a problem with comments on this blog, and comments I'm leaving on others blogs; where comments are posting but the blog owner's e-mail rejecting the comment e-mail and the comment leaver getting a rejection e-mail. If you get that e-mail, send me a note at samuelpair@yahoo.com so I know you left a comment! Going to try and start showing off some of my pick ups over the last 6-7 months... got a lot of new stuff... mainly Biggio but several other awesome cards as well! After nearly 7 months of silence, I return from the dead. I'm not collecting like I used to but I am back in a limited capacity. Let me explain, back in April, I did something really stupid and blew a bunch of money. I lost track of what I was collecting, how I was collecting and why I was collecting. I sold off 100% of my non-Astros permanent collection. I've gained some perspective. I join a group break here or there, and I stopped buying retail. I also don't have a LCS here in Stinnett, TX so I have nowhere to go buy cards either. I maintained a presence on Twitter, but that's about it. Yes, I moved. No longer in Alabama, I'm back in the greatest state in the country: Texas. That's my opinion, I'm sticking to it! I'm not running breaks, I'm not providing snarky self-congratulating posts, and I'm not acting like I've re-invented the wheel in my collecting world. I buy a Collector's Crate once a month, and I get in a group break or two and I end up with some bait. I still go after Astros primarily (and Nolan Ryan, Craig Biggio, Jeff Bagwell and Lance Berkman specifically). I may trade for a J.J. Watt card if you have one. Other than that, don't get your expectations too high. There is a page on this site (look at the top of this page for "TRADE BAIT" that'll have pictures of my current offerings. I'll post them here too, but if you want to trade, leave a comment or e-mail me. I also have quite a bit of cards on COMC.COM under the seller name "thedailydimwit". If you like something you see there of mine and my price is too high, let me know and I'm sure we can work something out. I am not sure how many of you still follow this thing, so if you do and you wouldn't mind, just leave me a comment. 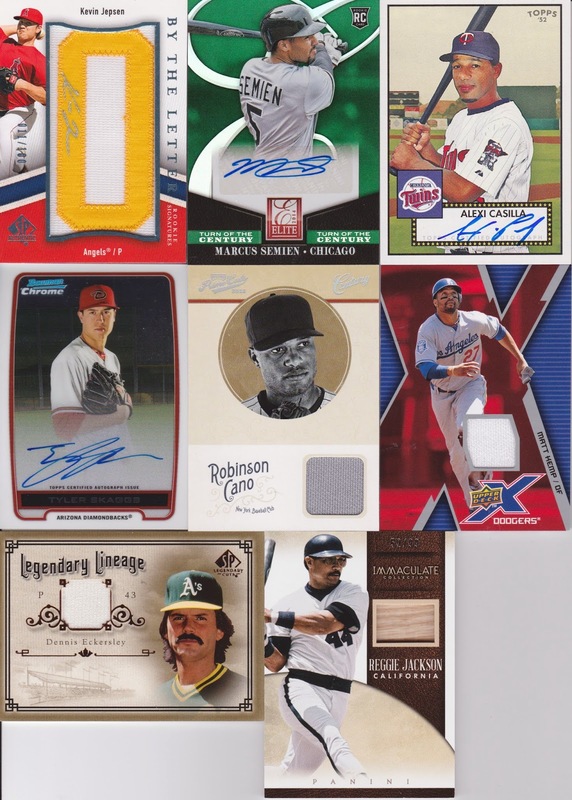 Everyone doing so will be entered into a contest for a stack of cards from your favorite team. Hello again everyone. Nice to be back.